The EZ Caps kit is the easiest, lowest priced home brewing and wine making kit ever invented. Enjoy your beverage at 5-17% alcohol in just a couple of days! An EZ Cap is like any normal cap you would screw onto a plastic pop bottle except that it's a pressure release valve that prevents the bottle from exploding and also keeps contaminants out. Using any fruit juice and regular 2-liter pop bottles, this EZ Cap Kit contains everything you need to convert up to 300 liters of juice into tasty alcoholic beverages in the comfort and privacy of your own home. Not for use with glass bottles. Know you're buying from the manufacturer, never pay more than $12.99 for this beer, wine, mead, alcohol making kit. Kit includes a lifetime of product support including free access to our user forum for sharing recipes and experiences. Did we mention that there is a 10% off coupon code for Amazon purchases available at the manufacturer's web site? NOT FOR USE WITH GROWLERS OR ANY TYPE OF GLASS CONTAINER. Kit includes enough supplies to make up to 300 liters of alcoholic beverages. 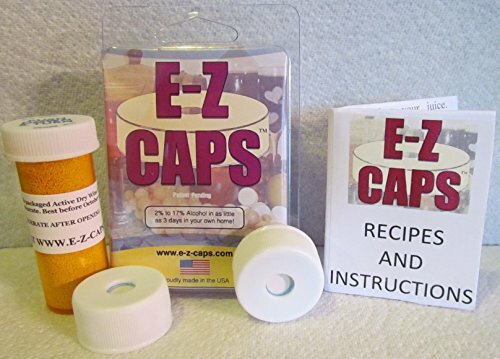 Kit includes 2 reusable caps, instructions, large bottle of EZ Caps yeast, recipes and instructions. Use with regular plastic soda pop style bottles. NOT FOR USE WITH GLASS BOTTLES. If cap is not maintaining enough pressure, please tighten it! If you have any questions about this product by EZ Caps, contact us by completing and submitting the form below. If you are looking for a specif part number, please include it with your message.